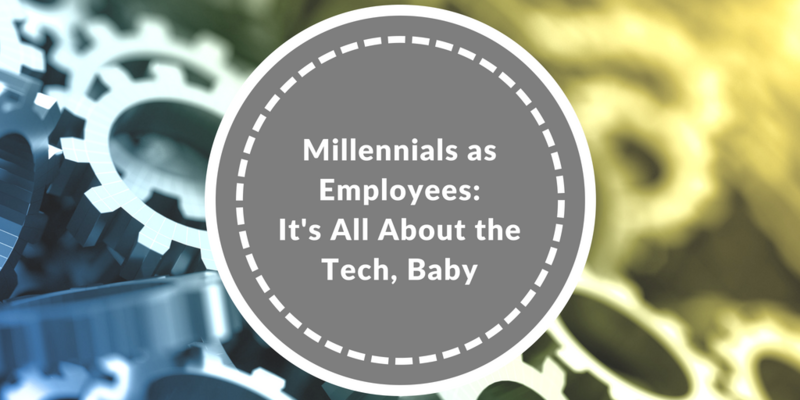 Millennials as Employees: It's All About the Tech, Baby! Most millennials like myself grew up playing video games, whether it was online or through consoles like Wii and Xbox. What intrigued me the most about playing video games was the challenge of conquering each consecutive level as quickly as I could. My gaming experience fuels my eagerness to see instant results in the work that I do -- a trait that I have carried along through the years, and I'm sure I'm not the only one. Traits like this are cultivated from the fast-paced, technology-fueled society in which millennials have grown into adulthood. These generation-defining traits will have a deep impact on the evolution of the modern workplace, forcing unconventional changes to take place. The technological landscape of today is much different than that of previous generations. Millennials have been lucky enough to witness a revolution in which technology has rapidly evolved as a catalyst that impacts all areas of life. The full effects of a whole generation steeped in video games and shaped by unprecedented modern technology are yet to be seen. However, as millennials start to take over the job market, this will become more apparent. Adapting to the unique needs and expectations of millennials as employees will be important as employers attempt to attract and retain the best talent in their industry. Not only have millennials grown up in a new age of technology, they are also going to replace Baby Boomers as that generation retires from the workforce. In fact, a report by The Pew Research Center predicts that an average 10,000 Baby Boomers will retire each day for the next 19 years. That means that more and more of the job market is going to be left behind by Baby Boomers and filled with millennials. Already, as of 2017, millennials make up the largest percentage of the U.S. labor force with 35% of the job market between the ages of 21 and 35 as reported by The Pew Research Center. Don’t worry! There are some relatively easy changes that you can implement now in your workplace to draw and retain millennials, and to create more satisfied and engaged employees across generations. With a growing gap in the job market between talent needed and talent available, employers must amp up their recruitment game. A major consideration is the different reasons Baby Boomers versus millennials are attracted to a company. While Boomers have traditionally prized job security, millennials are more attracted to things like corporate social responsibility, company culture, and access to the latest technology tools. Another difference is that millennials do not necessarily feel a sense of loyalty to stay with the same company if they feel like their needs are not being met, as mentioned in a study done by PWC. The differences between these two generations are almost day and night, so it’s crucial to note how to change your recruitment strategy for new employees in order to attract and retain millennials. Previous generations have accepted the status quo of working a minimum 40-hour week. In contrast, millennials tend to look for a healthier work/life balance. This means millennials increasingly prefer scheduling flexibility as to where and when they can complete their work, transforming office spaces more into collaborative spaces. When working with millennials, employers must set clear expectations and deadlines, but leave the particulars of where and when up to the employee. Generally, employees who feel they have autonomy over their working style are the most productive. Millennials have grown up in a revolutionary period where modern technology has transformed everything they have encountered. This means if you have not integrated the newest technology into your workplace in some way, shape, or form, you may lose your millennial employees to more technologically advanced employers. The aforementioned study done by PwC states that millennials are more likely to feel stifled in their creativity, and that 59% felt that an employer’s use of state-of-the-art technology was important to their professional development and ability to optimize their productivity. According to the PwC study referenced above, millennials rate clear opportunities for advancement above even monetary compensation as a major factor when choosing an employer. When asked what they prioritize when looking for a job, 52% of millennials surveyed reported that they consider opportunities for career progression first. 44% said that competitive wages are a secondary component to what makes an attractive employer. Clearly millennials are driven by ambition and optimism as they consider mental stimulation on the job more important than the pay. In order to account for this, employers should consider promoting a person who has displayed leadership and initiative rather promoting based on traditional hierarchical structures. Although millennials don’t consider salary as their main priority, Health iPASS will increase your practice’s revenue by increasing patient collections, which in turn can be reinvested in your employees and in their office experience. Health iPASS is a simple revenue cycle management solution with a multitude of benefits that help you prepare for the new generation of employees while improving the health of your practice by increasing patient collections. Upgrading your patient revenue cycle management by using our state-of-the-art technology will make your practice more attractive to future employees and in turn increase employee retention. While these tips are intended to better prepare employers to work successfully with millennials, many of these strategies represent best practices for working with employees of all ages. If you want to learn more about millennials specifically, check out our first post in this miniseries on millennials on how to adapt your practice to millennial patient revenue cycle needs.